I recently purchased the DVD of Peter Follansbee and his lessons on 17th Century Carving. I’ve been a huge fan of Peter’s blog for a long time, and so this was a no brainer. I also picked up a V-tool to try the first basic lessons. I got a little time last night, and I decided to give it a go. No planning, no good wood, just what the heck, pick up a piece of scrap and go at it. Results pictured above are pretty shaky, but I can see how it works now. It’s putting to practice what I’ve been reading about, and it’s always different when you actually try it. I want to get some better wood (crappy pine board is not going to do me much good really, although I could add some carved decoration to some boxes if I am careful, and use simple designs. The compass was recently discussed here on Peter’s Blog, and I dug out the couple of dividers I picked up for cheap at Harbor Freight the other day. I never really used them because I didn’t like the pencil holder, it just got in the way. Tonight I clamped the pencil ring into my metal vise and just levered it off. It popped off easily, and there was a little bit of weld residue left, but otherwise it was clean. It became much more useful that way, because I could grab it with both hands and walk it around. I tried some gouge work but that was more fail than anything else. I’m really not sure what the gouges I’ve got are. Are they carving gouges? or firmer’s gouges? I’m just not sure. I also spent some time learning to sharpen them on my new stones, and that went better than I expected. I got a reasonable (not quite decent edge) despite not having a clue what I was doing. I’ll have to study a little more to learn a little more technique. That’s how I learn. Read. Try it. Read again. Try it again. Eventually I’ll either get it, or give up. 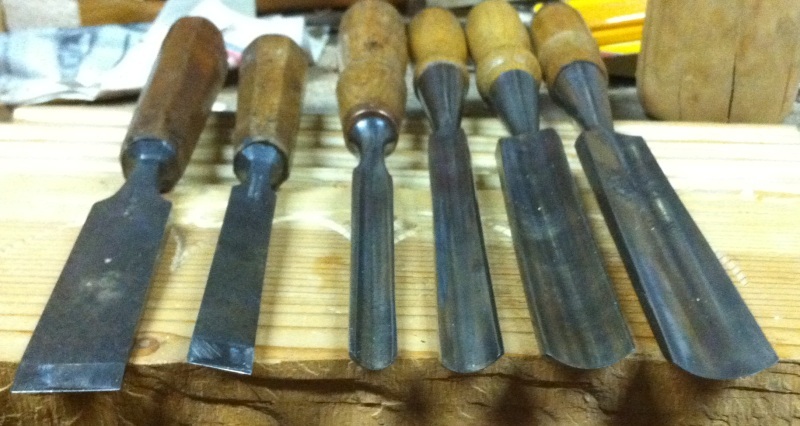 If any one has any knowledge on Chisels, and can help me identify the chisels pictured, that would be most excellent. Can I use these for carving? My results were mixed even after sharpening. 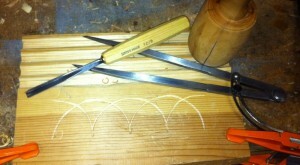 The two chisels on the left are carving chisels. You can tell because they have tangs and octagonal carving-tool style handles. The three gouges on the right are firmer gouges; they’ll probably have thicker/stouter steel and a socket handle for rougher pounding carpentry work as opposed to carving, but you could use them to carve bigger stuff, too. With a sure hand, firmer gouges can be used to zip up a large dado or groove. I think they may have been used to put notches in studs for electrical wiring or odd framing jobs. The middle gouge (third from left) is probably an old Buck Bros. carving gouge. I have a couple of these and their construction seems intermediary; you could carve or pound with them. 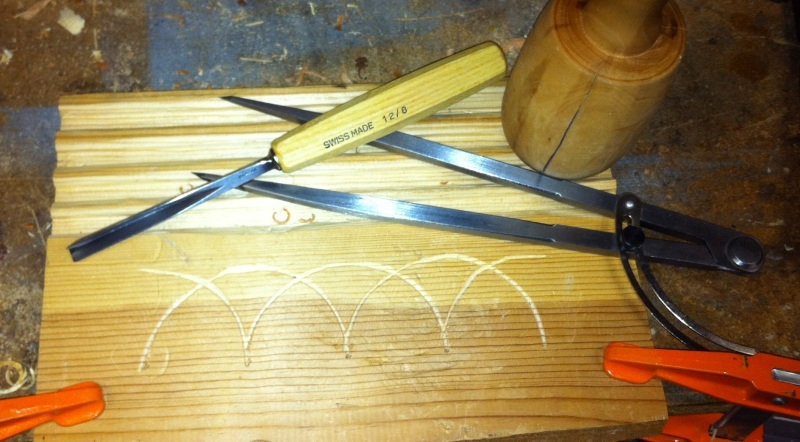 Generally, carving tools/gouges have somewhat thin cross-sections owing to their more delicate task, but also because it takes less effort to push 1/16″ of steel gouge through wood than 3/16″.